The Large Flush Wood Hybrid-Fyre insert is the cleanest burning large wood insert in the world. This insert burns so clean that is produces only 0.58 grams of emissions per hour, while testing at over 80% efficiency! This insert features the signature Wilmington face and large arched cast iron door with ceramic glass to present a stunning fire-viewing area and clean design that five the impression of a custom door on a fireplace. It is approved to fit into large zero clearance and masonry fireplaces with its 19″ depth and 3 cubic foot firebox. 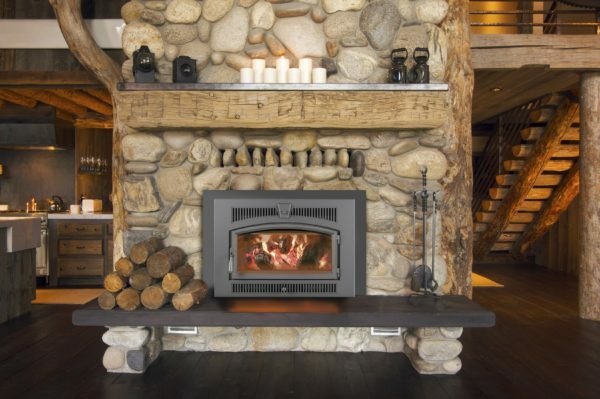 This inset heats up to 2,500 square feet and has up to a 12 hour burn time. It also features powerful standard twin 90 CFM convection fans for more heat circulation. The Large Flush Wood Hybrid-Fyre insert is 20% more efficient than a typical wood insert, burning less wood and delivering more heat.